Sahir Lodhi is one of the most popular TV Hosts in Pakistan. He is very trendy among youth. He hosts “The Sahir Show” on Geo TV. This show is telecasted at 10 pm from Monday to Thursday on Geo Entertainment TV. Sahir Lodhi is passionate about Radio and he got preliminary fame from his Radio Program on Mast FM 103. Sahir Lodhi is the brother of Dr. Shaista Wahidi. 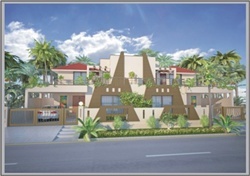 Khayaban-e-Amin is a housing project by Sahir Associates. 5 Marlas (Single and Double Storey), 10 Marlas (Double Storey) & 1 Kanal beautiful houses and Independent Apartments are built in Khayaban-e-Amin, Lahore. Now Sahir Show is being organized at Khayaban-e-Amin Lahore. Sahir Associates and The Sahir Show Team jointly announces free house at Khayaban-e-Amin through lucky draw. It is also hoped that more than one free house will be given to winners. Note: The Prize may be different from given picture and it may have different design, structure and covered area etc. Sahir Associates, The Sahir Show and Geo TV have right to alter/revise rules and/or prizes at any time. We don’t bear any responsibility in this regard. How to Participate to Win a House? Just send an SMS to participate in this draw. Write Sahirh Your Name Your City Your CNIC and send it on 436 from your mobile phone. Rs.5+tax per SMS will be charged. Winner/ Winners will be announced on 18 August, 2011 in The Sahir Show. dear sir i am a disabled person and running an NGO for disabled persons i need u r help if u have time for this noble cause plz contact me for Allah,s mercy. i hope u will no disjointed.